Greensboro is the third largest city in North Carolina. It is located in Guilford County, in the central Piedmont area of North Carolina. The City is home to seven colleges and universities: The University of North Carolina at Greensboro, North Carolina A&T State University, Elon University, Bennett College, Guilford College, Greensboro College, and Guilford Technical Community College. NC A&T and UNC Greensboro have the nation's only Joint School of Nanoscience and Nanoengineering, which provides equipment, research and a powerful knowledge base to collaborating companies. Our offices in Greensboro are located in the Renaissance Plaza, a 20-story, granite building located in the southeast quadrant of North Elm and Bellemeade Streets. Parking is available in the deck located behind the Renaissance Plaza (accessible off Elm Street). Alternate parking is available in the Bellemeade Parking Deck, located directly across North Elm Street from the Renaissance Plaza. Follow Business 85 via Exit 120A toward Greensboro. Take US 220 North via Exit 35B. Merge onto Freeman Mill Road. Freeman Mill Road becomes Edgeworth Street. Turn right onto West Market Street. Turn left onto North Elm Street. 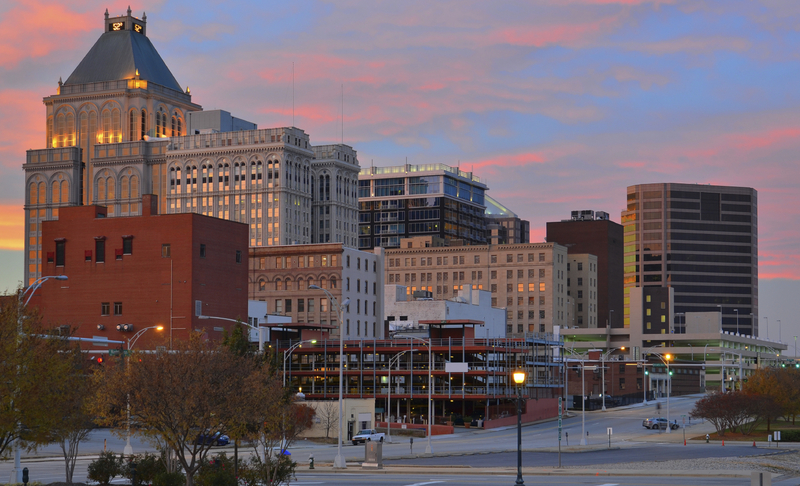 Renaissance Plaza is on the right just past Center City Park, at the intersection of Elm and Bellemeade Streets. Keep right via Exit 131 to continue on I-40 West/Business 85. Take Exit 224 onto East Lee Street. Turn right onto Edward R. Murrow Blvd which becomes South Murrow Blvd. Turn left on East Friendly Avenue. Turn right onto North Elm Street. Take I-40 East toward Greensboro. Take Exit 218B to merge onto Freeman Mill Road. Continue onto South Edgeworth Street. Turn right at West Market Street. Turn left at North Elm Street. Take the Bryan Boulevard East ramp toward I-40/Greensboro. Bryan Boulevard becomes Benjamin Parkway. Benjamin Parkway becomes West Smith Street. Continue on Smith Street to Elm Street stoplight. Turn right onto Elm Street. Renaissance Plaza is the first building on the left just past the intersection with Bellemeade and Summit Streets.